As we did in this week's Starting Pitchers Buyers Guide, let's take a very early look at some notable week one performances among batters by putting them into the bigger context of the player's preseason outlook. The goal is to help you identify which extreme performances are worth buying into, as well as which you should view with a skeptical eye. Keep in mind that current data samples are tiny, so our focus very early in the season will be to discuss only extreme performances in this space. Willy Adames (SS, TAM) carries a lot of potential in his age 23 season. But few batters have looked more overmatched over the first 10 days of the season than Adames. He has an ugly 0/14 BB/K in 27 AB. And he's not hitting the ball with any authority when he does make contact. He remains a worthy investment in keeper leagues, but you might want to start tempering your expectations for 2019. Willians Astudillo (C, MIN) likely will qualify all over the diamond later in the season given his versatility. Another amazing trait is his ability to make contact. After posting a 97% ct% with MIN in 2018, he didn't strike out this spring. And he hasn't struck out so far in 2019 either. Yandy Diaz (DH, TAM) has shown some pop early in the season (2 HR in 25 AB), giving early profit to owners who drafted him at his friendly 516 ADP. While Diaz is still hitting the ball on the ground, a look at his FB% trend the last few years does give very early hope that his power isn't a fluke: 19%, 23%, 27% FB%. In fact, his power has been backed by a 143 xPX. And his plate skills have been pristine: 14% bb%, 88% ct%, 1.33 Eye. Diaz could be a steal for owners who drafted him. Ramon Laureano (CF, OAK) has gotten attention due to his lethal throwing arm, as well as his early multi-category production (2 HR, 1 SB in 38 AB). Problem is, few hitters have put up worst plate skills than Laureano (1/14 BB/K in 38 AB). Expect continued ups-and-downs from his bat until he can make consistent contact. Yoan Moncada (2B/3B, CHW) is looking like an early breakout target. He has been excellent so far in 2019 (1.394 OPS in 24 AB). Even more impressive has been his collection of plate skills, including a much-improved contact rate: 11% bb%, 83% ct%, 0.75 Eye. His flyball rate has ticked up again (35%, 40%, 50% FB% last three seasons). Sure, a 50% h% has helped his quick start. 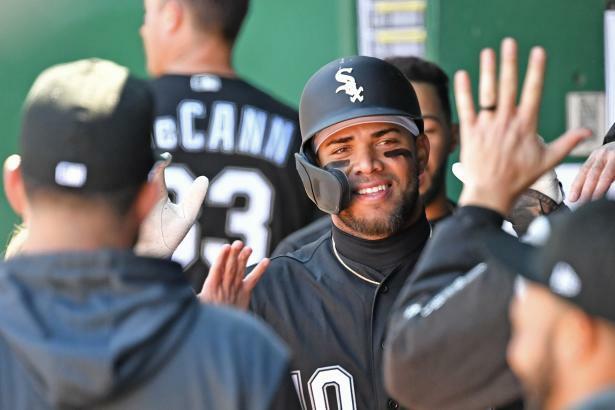 But Moncada appears on his way to a big season. Christin Stewart (LF, DET) has posted an ugly .434 OPS in the early-going, causing some owners who speculated on his power to think twice about that investment. But that mark has been driven by a crazy 4% h%. His plate skills haven't been terrible (13% bb%, 64% ct%, 0.44 Eye). Now's a good time to buy low on Stewart. Daniel Vogelbach (1B, SEA) has shown his patience/power profile early in the season after not being able to do so during his prior MLB auditions. He has a 14% bb% and 1.500 OPS over his first 11 AB. Sure, that's a tiny sample, and he's got a long ways to go against lefties to fill a full-time role. But he's a worthy stash in deep AL-only leagues. Ronald Acuna (LF, ATL) owns a rough .167 BA in his first 24 AB. However, there's no reason to panic. It has been the result of a tiny 11% h%. He actually has been able to muster a .750 OPS in spite of that hit rate. And his plate skills have been excellent: 20% bb%, 83% ct%, 1.50 Eye. Austin Barnes (C, LA) is showing some very early signs that 2019 will be a rebound season for him. Barnes has put up a 1.337 OPS over his first 15 AB. And he hasn't done so by hacking his way there. In fact, his plate discipline has been nearly perfect (12% bb%, 93% ct%, 2.00 Eye). Bounce-back targets don't get much better than Barnes. Maikel Franco (3B, PHI) has been the NL's best hitter over the first couple of weeks of the season. Not only has he shown power (3 HR, 1.537 OPS in 18 AB), Franco's plate skills have been untouchable: 33% bb%, 89% ct%, 4.50 Eye. His prior prospect pedigree suggests he has 30+ HR upside. And if he can round out his skill set with additional walks, he could be on his way to an age 26 breakout season. Enrique Hernandez (CF/2B/SS, LA) entered the 2019 season with some breakout appeal after the way he finished 2018. So far, so good. He has a .370 BA and 3 HR over his first 27 AB. And his plate discipline has been top-tier: 15% bb%, 85% ct%, 1.25 Eye. His power has been backed by a 150 xPX too. He remains a strong breakout target. Joc Pederson (CF, LA) is another post-hype player whose career is on the upswing. He has improved his contact rate in each of his six MLB seasons. His plate skills now sit at a strong 15% bb%, 80% ct%, 1.00 Eye. And his power has gone from good to great (248 PX, 272 xPX). Don't be surprised if Pederson posts career-highs in several categories this season. Christian Walker (1B, ARI) has delivered some surprising power so far in the early part of 2019 (3 HR, 1.143 OPS in 23 AB). And injuries in the ARI infield will give him an opportunity to play every day for a while. Walker has shown much better contact (78% ct%) than he has shown in prior MLB stints. If that sticks, he could provide good value over the next month or so. Kolten Wong (2B, STL) has looked like a multi-category stud over the first 10 days of the season (.417 BA, 3 HR, 2 SB in 24 AB). Is it a sign that he will finally deliver on his potential? A 44% h% confirms luck has been on his side. But his plate skills are solid, and he is finally getting a strong green light (25% SBO%), albeit in a tiny sample size. He could be a good BA and SB contributor in 2019.